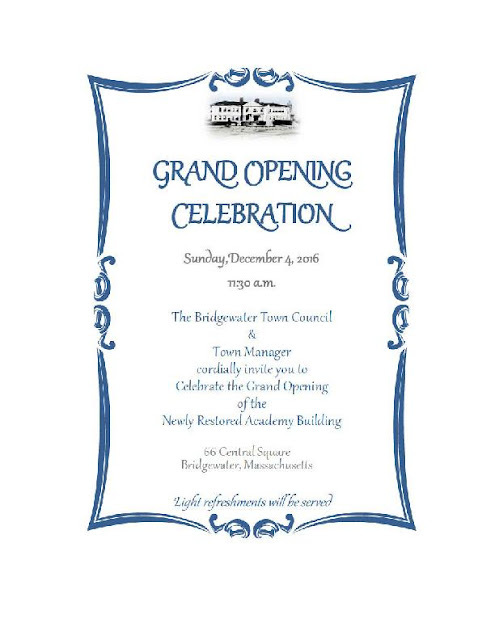 The Town of Bridgewater wishes to invite the community and local press to attend a grand opening of the newly renovated Bridgewater Academy Building. 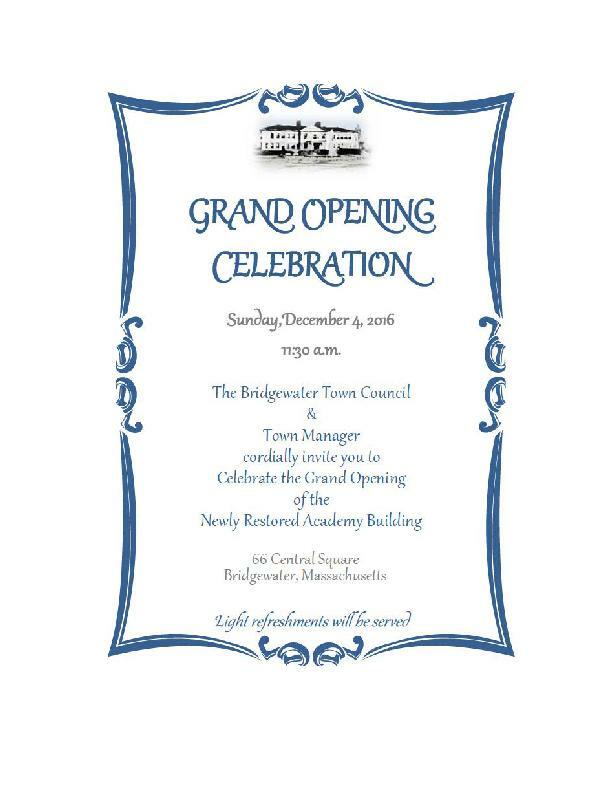 The grand opening, on Sunday, December 4th at 11:30 AM caps off a major three-year renovation project to rehabilitate the historic structure into usable work spaces for the Town’s administrative offices. The project was funded through capital bonding and with funds approved by the Bridgewater Community Preservation Committee. The total cost of the project was $7.5 million. The Academy Building renovation project was conducted by Town of Bridgewater in cooperation with Tappe Architects, Bargmann, Hendrie & Archetype, Inc., and M. O’Connor Contracting, Inc. The furnishings of the interior were selected by the Town in cooperation with Workplace Management and Creative Office Pavilion. The new, modern Academy Building fountain and seating area was the collaborative effort of the Town and the Bridgewater Improvement Association. Of the new amenities within the building, chief among them are the Town Council Chambers, meeting spaces, and a state of the art energy efficient climate control system. The Academy Building has served the community in various capacities over the last century, as a privately owned preparatory school, a high school, Bridgewater Police Department and most recently as town offices. Learn to Curl in January!